Jaron McLain started at PennDOT in 2015 as an engineering technician with the Pittsburgh-area district. One year later, he began his current role as a transportation construction inspector and auditor. Known for his hard work ethic within the office, McLain also boasts an interesting lifestyle outside of work that contributes to his bold and fun-loving personality. What are your daily job duties here at PennDOT? An as an auditor, I review all source documentation relating to the pay quantities for contracted items included in an audit. 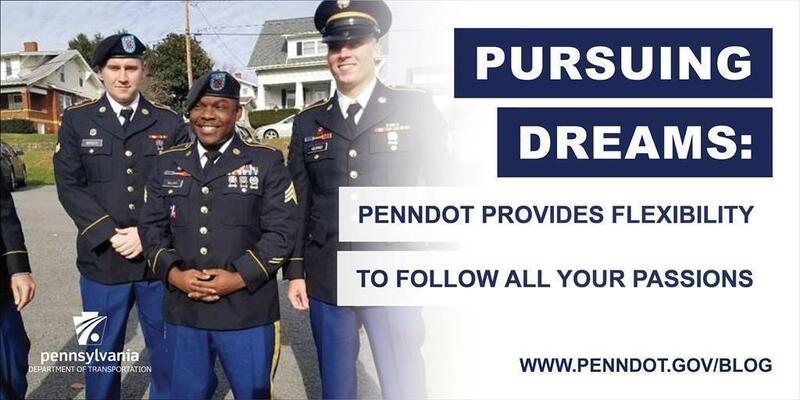 What do you like most about working for PennDOT? I really like the opportunities and flexibility that PennDOT offers. With my busy schedule outside of work, there has never been an issue with being in the military or going to a casting call. The opportunities are endless here. There is always room to grow and gain experience regardless if you're in the field or office. That is a major key ingredient to success! What do you do when you aren't working at PennDOT? I'm in the U.S. Army Reserve. I've been in the military for seven years. I served one long tour in Afghanistan from 2013 to 2014. My military occupational specialty (MOS) is 12B/12C, which is a combat engineer and bridge crewmember. 12B (Bravos) perform a variety of construction and demolition tasks under combat conditions, while 12C (Charlies) provide conventional, powered bridge, and rafting support for wet and dry gap crossing operations. Outside of work, what is the most interesting thing you are working on right now? My album and clothing line are the two things I'm most excited about currently. I've been working on my album for about a year and it consists of a variety of funk, R&B, soul, pop, rock, and doo wop music. It has a vintage sound. The sound I'm aiming for is an Amy Winehouse, Duffy, Bruno Mars type of sound. I used a variety of musicians on my album to help create specific sounds that I want. My clothing line is a project I started three years ago, and I can't wait for it to really take off. It's an athletic line for both men and women. So, we also heard you are an actor. What is the coolest acting role you have ever done? I played a SWAT. officer in "Faith Under Fire: The Antoinette Tuff Story." I really enjoyed that role. Last week, I did a filming for "Mindhunter," which is a Netflix series. I played an FBI agent. I guess the law enforcement/para-military roles are some of my favorites. Back to your album, what would you say is your favorite song to perform and why? I haven't performed any of my songs off the album yet, but one of my favorite songs to perform would have to be "Shake Your Body" by the Jacksons because that is a tune that gets everyone dancing — or at least singing — if executed the right way. It has a groove that can't be resisted. Outside of work, what skill would you like to master? I would love to master the bass guitar. I just learned "Another One Bites the Dust" by Queen and "Sugar" by Maroon 5.